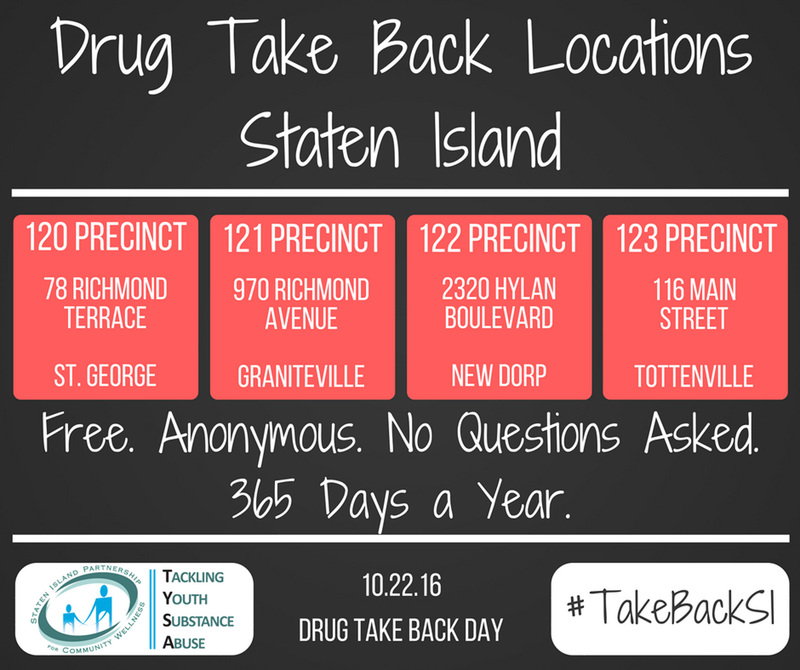 STATEN ISLAND, NY (Oct. 18, 2016) – On Saturday, October 22 the Drug Enforcement Administration (DEA) will celebrate National Drug Take Back Day to remind the public to prevent pill abuse and theft by ridding their homes of potentially dangerous expired, unused, and unwanted prescription drugs. Throughout the year, Staten Islanders have the opportunity to dispose of used and old drugs at NYPD precincts across the borough. Tackling Youth Substance Abuse (TYSA), an initiative of the Staten Island Partnership for Community Wellness (SIPCW), encourages families to use this day to check medicine cabinets to prevent accidental poisoning, overdose or addiction. The Take Back sites cannot accept liquids or needles or sharps, only pills or patches. The service is free and anonymous, no questions asked.